ersonalized Tape Measure, Leveler, Note Pad in Bulk. Cheap, Promotional. Best price in USA and Canada. Excellent Quality. 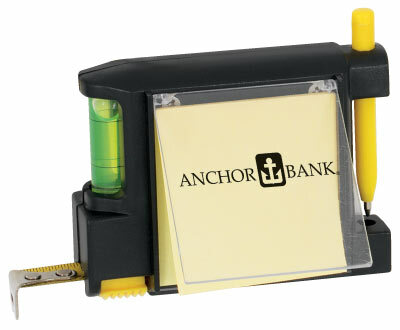 Bulk 3-in-1 Tape Measure with Leveler, Notepad and Pen, custom imprinted with your logo. We also supply wholesale blank (not personalized) 3-in-1 Tape Measures for $0.99 each. Budget Prices in USA and Canada for wholesale promotional Tape Measures with Notepad and Leveler. American clients pay no taxes. The unit prices below include your 1-color custom imprint on one side of the 3 in 1 Tape Measure. Production Time: 7 days after art approval; Blank 3 in 1 Tape Measures ship next day. measurements, lock button and belt loop. Imprint Size: 1-1/2’ x 1-1/2” silkscreen, on clear flip cover of the note pad. OVERRUNS AND UNDERUNS : We will ship the EXACT quantity you have ordered:, at no additional charge!